If you liked Bruce’s Sgt. Pepper book you will love his next book in his album series. With contributions by Bruce, Bill King, Al Sussman, Frank Daniels, Piers Hemmingsen and others. The 9″ x 9″ hardcover book will have tons of images, all in glorious color or original black and white. The book will be available in both a standard edition and a limited edition, which will come with an O-case, poster, bookmark and free link for the eBook edition. Pricing and ordering information will be announced shortly. Watch this space! I was an avid Beatles fan and eagerly anticipated the release of each single and album. I admit I was disappointed when the White Album was released. Not only did I think several of the songs were below par for the group (Revolution 9 the most obvious example, along with Honey Pie, Good Night, etc. ), but it gave me a very real sense that the group was falling apart. It was obvious that this was not really so much a “group” effort as individual Beatles recording their own songs. While lauded by many as perhaps the group’s best album, I’ve always regarded it as significantly overrated. I agree with George Martin’s assessment that it would have been much better if it had been a single album with only the best songs on it. I turned 13 on November 23 and up untill then this was the best birthday present i ever had. My father drove me to Sam Goody’s and bought me the album for my birthday! Fifty years and several well worn copies later, it’s still my favorite! I cherish memories of buying the “White Album”. I was fifteen in 1968, and a huge music fan. Although I was hearing some of the cuts playing in a local record store, and loving them, I had to wait until I received Christmas money from my aunt, to be able to buy the album. On a very cold day after Christmas, I caught a bus downtown (Baltimore), bought the record and rushed right back home. I played both albums immediately. I had to take a break for dinner, but of course continued to listen for the rest of the night and for the next week (it being Christmas break!). I was amazed at the variety in the songs. I also loved the printed lyrics on the poster! I still tell this story fifty years later. In late Fall, back in 1968, I was a 14 year old, 8th grader in a small town in Upstate New York. My older brother and I were huge Beatle fans since day one (Feb. 9, 1964). We each bought every album when they came out. When we heard that the new album was going to be a double LP, we couldn’t wait to hear it. The day it was released my brother and his friend took me and one of my friends (all of us Beatle fans) to the shopping center so that we could all buy a copy. I remember coming home and my friend and I in one room, and my brother and his friend in his room, began listening to this masterpiece. We were all so excited. We each kept sticking our heads in each other’s room saying “WOW, did you hear that?!!”. That’s why in my 1973 High School Graduation Yearbook my fondest memory is listed as “when they released the Beatle’s White Album”. September 1968: I am 13, before the start of the school year, a big surprise awaits me at my favorite record store of the corner. A new Beatles 45, with no more Capitol label and a song that does not seem to finish. I even thought that my record was broken. Friday, November 22, after school, I went to my record store to buy the new Beatles album. Shocking : while showing me a white cover with the name of the Beatles embossed, my nice record dealer kept the only copy he received. So the next morning, I went downtown Montreal at Eaton to get my hands on an album that would become my album fetish, The Beatles. Happening : my older brother and several friends showed up to listen to it. I already had my favorite side (B) and all agreed that the Beatles had become unsurpassed. On the following Friday, at school, during the free period of drawing, I was allowed to bring my LP and, after listening to the A side and in front of a class in ecstasy, the teacher claimed that the Beatles would be a thing of the past well before the year 2000! In November 1968 I was a 13 year-old kid in the 9th grade, living in a small suburban town in northern Ontario (Canada). Before roughly ‘Day Tripper/We Can Work it Out’ and ‘Rubber Soul’ the Beatles had belonged to my older sister and her friends. By ‘Revolver’ though, they’d all stopped listening and by ‘Strawberry Fields Forever’ it was all ‘my’ music. One evening just before ‘The Beatles’ hit the store shelves (November 25) a local AM station played the entire sprawling, beautiful mess uninterrupted, save some in-between-sides blather. While the rest of the family watched television in another room I sat more or less glued to the floor in front of our Seabreeze hi-fi and took in the whole thing from start to finish. Wow. There’s just no way to describe the experience without resorting to the usual clichés: This was a musical journey, and the journey is still crystal clear in my memory nearly 50 years on. bought the BEATLES on the day of release. a great 2 disc set. i disagree that it should of been released as a single lp. revolution 9 was an ear opener..number on BEATLES is A 1497152. I remember it like it was yesterday: I had just turned 10 years old when the ‘White Album’ was released, and my parents bought it for me as a Chanukah present from a local record shop where we lived in Chicago. This was an especially significant event, as it was the first Beatle album that I got upon release, and I played it over and over on my mono record player (the kind that was in what looked like a grey-colored brief case). The poster and individual pics were of course immediately thumb-tacked to my bedroom wall. I still have my original copy of the album, including my own “enhancements” to the plain white cover – 4 Day-Glo stickers from a local head-shop, including one that says “Snoopy has fleas” …keep in mind I was only 10! My buddies in the neighborhood and I were all big Beatle fans, and the ‘White Album’, along with the ‘Hey Jude’ single that preceded it, were constantly played and talked about. I have to admit that back in that era I was a little spooked by ‘Revolution 9’, having no idea what it was about (and not really sure that I do today). Fortunately, there were plenty of other songs on the double album that I really liked, and still listen to 50 years later. I’m Mark Arnold, author of “Mark Arnold Picks On The Beatles”. “The Beatles” a.k.a. 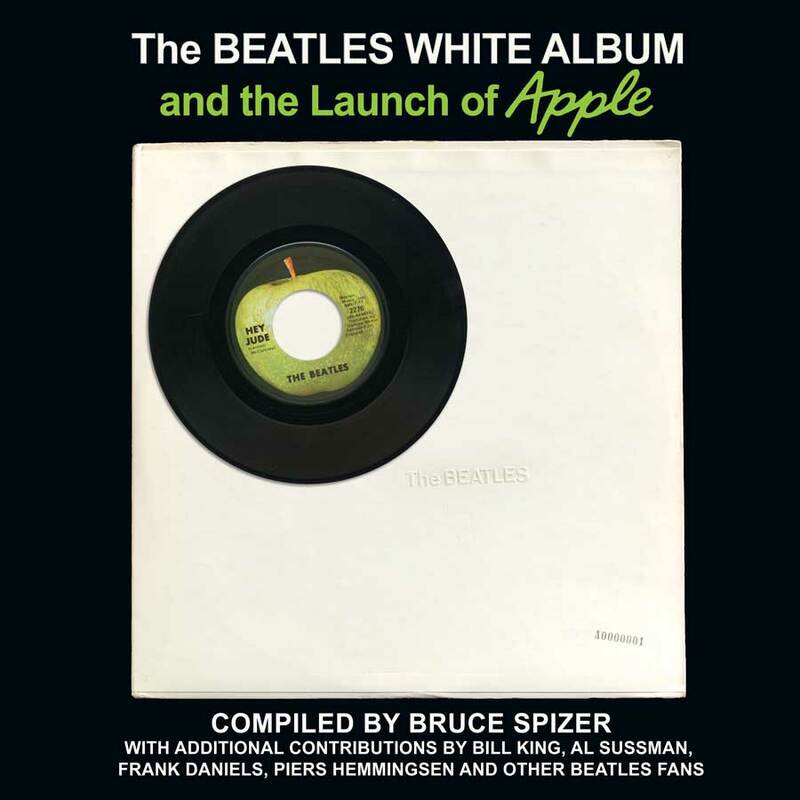 “The White Album” is my favorite Beatles album, but it wasn’t always. I became a Beatles fan in 1977 at age 10, and started slowly picking up their albums. I owned Carr and Tyler’s “The Beatles: An Illustrated Record”, so I knew OF the White Album, but as it was a double album, it cost more than their other albums, so I avoided it for the longest time. I’ve tended to like the 1967-1970 era of The Beatles, so finally after getting all of their other albums of the era, I finally saved enough money to plop down for the huge double package. I believe it sold for the unwieldy price of $11.99 new. I wasn’t knowledgeable about used record stores yet. In any case, I played the LP in one sitting and was as amazed as I was with their other late era albums, but I noticed one difference that was similar to “Let it Be”. It wasn’t completely polished, which actually charmed me. There were snippets of dialogue and other little throwaways. I didn’t know if I liked it at first, but eventually it grew on me; even “Revolution #9”. I find the album to be like a battle with the rocker-type songs on side one and three, and the ballad-type songs on side two and four. It’s like a three-act play culminating with “Revolution #9”, and then there is peace… and “Good Night”. I feel that it was the final time that The Beatles were really pushing the limits of what they could do. “Abbey Road” seems to be more polished and designed to be a final statement, and “Let it Be” originally was supposed to be a simpler “live” album with no excessive production. Both albums seem “safe” compared to the more daring and original White Album as if they tried to reel it all back in. In all honestly, it became my favorite Beatles album because of Tower Records’ old “Pulse” magazine where they had regular Desert Island Disc columns. I liked the idea of choosing the White Album because the two discs count as one album, so more Beatles music to go around. Back in the pre-internet days, it was very difficult to get information about pop culture other than what the TV handed out. So when my junior high school friends and I saw “The Beatles” with a plain white cover costing twice as much as any other Beatles album, we didn’t know what to expect. And none of us could afford it. Then one morning my friend Steve came to me all excited. He had bought the album! He proudly copied down all the song titles for me and I eagerly read them. Happiness is a Warm Gun? The Continuing Story of Bungalow Bill? While My Guitar Gently Weeps? Piggies? Glass Onion? Back in the USSR? Why Don’t We Do it in the Road? I threw the paper back at him. I wasn’t going to put up with this silly trick with his made-up Beatles songs. Hi Bruce, my one and only memory of The Beatles White Album first arriving in my record store: I was 10 years old and I can remember this moment as if it were yesterday as it’s been burned into my long term memory… I loved The Beatles music and was forever listening to the radio for any new songs. I frequented LaVerdiere’s Drug Store in Gardner Maine had a large music department and I was there on a Saturday with my Dad and left alone to visit my favorite departments: the toy dept and the record department! I remember seeing dozens of the white album taking up 2 full record bins. I carefully looked at each one which carried a $9.98 cardboard tag stapled to the top left side of the covers with me wondering how I could ever come up with that much money! Each sealed white album had a large sticker on the front listing every song on the new album! I remember reading through every song title. I thumbed through every copy in both bins wishing I had the money to buy this record and wondering what magic lies waiting to be heard on this new Beatles album that was void of all photos of my favorite four. Where are The Beatles I wondered?! Little did I know then that I was to wait nearly a full year before getting a copy of this wonderful album! I first encountered the White Album in late ’77 or early ’78 when I was 10 and my father bought a car with a tape deck. My stepmother bought it on cassette and we listened to it on drives around Los Angeles. I was already familiar with Abbey Road (favorite track at 10: Octopus’s Garden) and gravitated towards the more whimsical tracks like Rocky Raccoon and Why Don’t We Do It In The Road. I probably would have played side two on continuous repeat, given the choice. Dad would turn down Revolution #9, so that conversation could continue, but he never turned it off. Ten years later, I was sharing an apartment with a serious Beatles freak and we bought copies of the CD on the first day of its release. I recall my booklet had a number in the low 3-digits and Mark’s was much higher. I was a prick about this stuff and didn’t trade with him. I rode my bike over to the “Two Guys” superstore on the day the White Album was released in San Diego. buy the White Album, and not only did they give him the money to buy it, they said to get one for me, too. That was a memorable moment, and I still have it (A 0541569) today. “I don’t want Easter candy, I’d rather have a Beatles record!” I remember exclaiming as a 12 year old who was Chicago’s biggest new Beatles fan of the 1970s. It was my intention to collect every Beatles song available to play on my new vintage portable record player. Grandma took me to the nearby Musicland and I picked out my substitute for an Easter basket: The Beatles White Album. It sure gave me a lot of songs to check off my list. I was starting to decorate my room with Beatles pictures and I remember arranging the photographs included like a checkerboard on my wall, aside other pictures from magazines and photocopied out of library books. I made myself a “schedule” to learn the songs and diligently listened at least once a week, even Revolution 9. When Helter Skelter came on, I recall my Grandma saying, “OK, time to put on the headphones.” I remember impressing my friend by shutting off the turntable and moving the record backwards with my finger to hear what was supposed to be “Turn Me On Dead Man” on Revolution 9. Although I was 10 years late for the album’s release, many years later I continue to enjoy the variety my favorite band offers on this special album. Looking forward to this. Thanks for such great work, Bruce. Meanwhile…any possibilities for an updated Price Guide? a n.y. station was going to play “The Beatles” album in its entirety a few nights before being released (11/22/68). I took a few notes on each track. after playing the whole album, I was numb. It was the greatest! fantastic! WOW! It still is my favorite because of the diversity. waiting on your new book. Good luck! Looking forward to reading your new book, the White Album is one of my favorite albums by the Beatles. I do own a first pressing from 1968 even though I was only 6 when the album was first released, it took me many years to find one so thank you Ebay.